What's there to say about these? They are oooie gooie goodness no one will know started with the world loved Ritz Cracker. THEY HAVE REESE'S PEANUT BUTTER CUPS!! Heat the oven to 350. Place tinfoil or parchment paper in the bottom of an 8x9" pan. In a bowl, combine the crackers, butter and cinnamon sugar. Stir to combine until it resembles wet sand. Press 2/3 of the crust into the bottom of the pan and bake for 6 minutes. 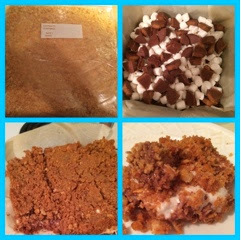 Remove from the oven and quickly sprinkle on the marshmallows, reese's and the left over topping. Bake for an additional 6 minutes and remove from the oven.